The Isle Airtech inflatable Explorer SUP weighs in at just nineteen pounds and measures eleven feet long. The board is able to support riders up to two hundred and seventy-five pounds. Considering the storage options, this board is perfect for longer adventures. You’ll be surprised at how tough this model really is, even in rougher waters. You’ll also be able to appreciate the extra carry handles, large cargo areas, and the extra thickness and length that will allow the board to be used by different family members. Overall, the Explorer is a great buy and works for both beginners and seasoned riders. This board is considered ultra-durable, considering it’s made from military grade PVC and offers a thickness of six inches, which means heavier riders won’t experience any flex in the middle of the board. The high-quality construction also means this board is hard to dent and ding. The board’s anti-slip pad features a diamond groove traction that helps to prevent the rider from slipping. 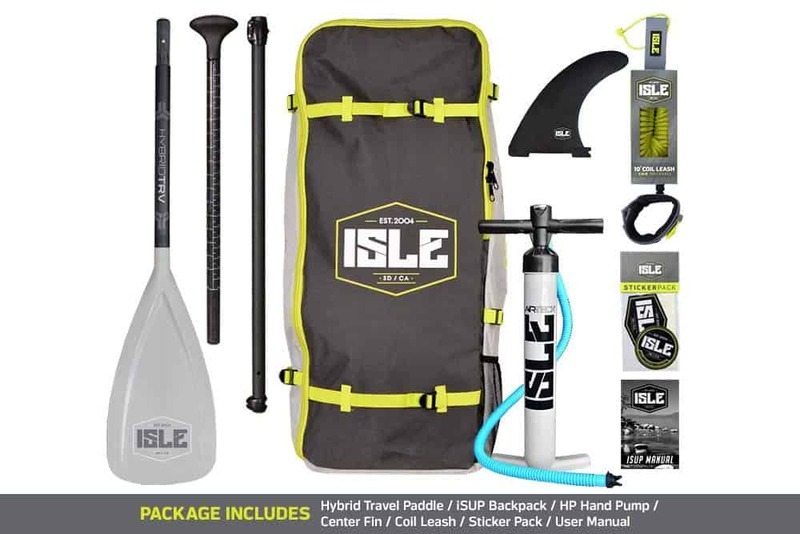 This SUP package comes with a high-pressure pump, carry backpack, repair kit, coiled leash, and a 3piece adjustable paddle. Consumers will also love the one-year product warranty on materials and the 30 day guarantee that allows users to return the board within one month for a full refund, no questions asked. With a length of eleven feet, thirty-two inches wide, and 6 inches thick, this is one big board which makes it super stable and great for all skill levels. In the center of the board, you’ll find a grab handle which is perfect for those times when you’re out in the water and trying to get back on your board quickly. Also, thanks to the layered, dense PVC, this inflatable board offers great resistance and durability, even in the roughest water conditions. 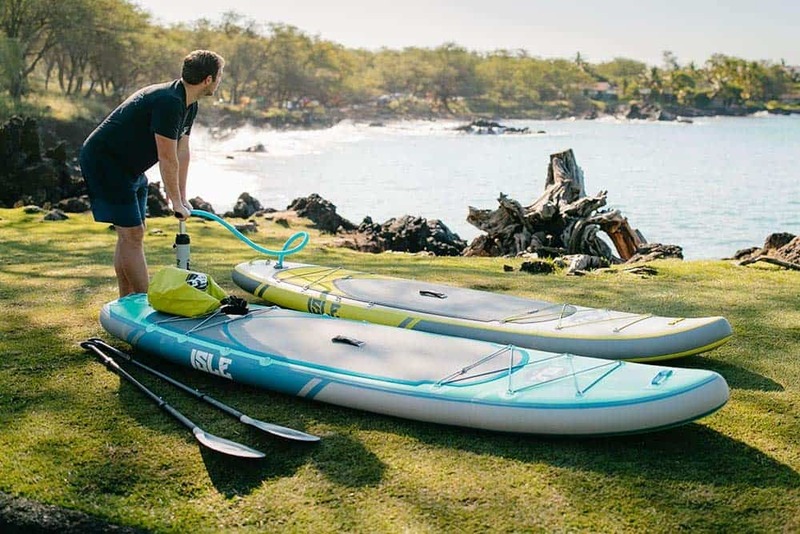 Not only does this paddle board package come with a three piece highly adjustable aluminum paddle, it also comes with a high-pressure hand pump that’s able to easily inflate the board up to 15 PSI, however, most consumers complained that inflation took too much time, and instead recommend buying a small electric pump. It also comes with a travel backpack that works decently. The board is equipped with a total of three fins, two of which are fixed and small, with one large removable central fin. This feature is something all riders will find useful and that’s the board’s D-ring system. Most models only come equipped with three to four D-rings, not offering much in terms of storage space. But the Explorer comes with an impressive fourteen D-rings, which are distributed as follows: you’ll find four on the sides located near the center of the board, another four on the tail, and a total of six located close to the nose of the board. The front and tail D-rings are connected with a couple of individual bungee cords, allowing the rider to securely store plenty of gear. While most riders don’t like loading up their board, this extensive D-ring system is perfect for storing snacks, shoes, or even attaching a kayak seat. We also liked that the Explorer is equipped with a couple of extra handles, so two people can easily carry the board out of or into the water. This inflatable stand up paddle board is very stable in the water and it’s easy to paddle. The board’s size combined with the triple fin setup make it a true pleasure to use. The extra inches in width also help to improve stability. The only thing that can hinder the board’s stability is if the rider packs the board too heavy on the back or front. The board’s glide performance is average. With a weight of just nineteen pounds, it doesn’t take much muscle to get this board slicing through the water. In calmer waters, the board wakes smoothly without any noticeable wobbling. User’s loved the sturdy strap handles located on the tail and nose that makes pulling the board out of the water so much easier. The large center fin screws off and on with a large plastic knob that is easy to manipulate by hand. This is a great board for the novice or the seasoned rider who’s looking for a board with a ton of storage options. If you plan on dragging your board onto shore a lot or toting it around while it’s still inflated, then you should consider this model for its carry handles on the tail and nose. These aren’t wimpy little straps, they’re actually very tough. Much to the surprise of many riders, this board is much tougher than expected. So, if you’re someone who is pretty hard on their gear and you need an inflatable SUP that’s basically bombproof, consider the Explorer. It’s beefy, thick, and short, making it a good choice for a wide range of applications and water conditions. This model is easy to transport but when it’s deflated it doesn’t roll up very small, which can make it difficult to put it back in the carry bag. The board didn’t score well in the inflation department. While it’s not as hard to inflate as some iSUP boards, it’s definitely not a smooth process. Because this inflatable SUP board is made from tough materials, inflation time can take a bit longer than a thinner board. The included gauge and pump are easy to use, but as we mentioned, using the hand pump can be very time-consuming. 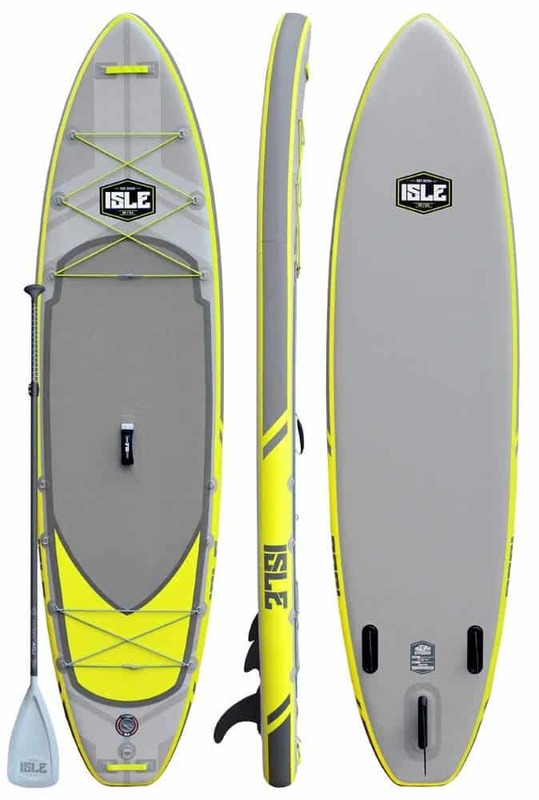 The Isle Explorer inflatable paddle board received a lot of praise and a high consumer rating. The board is super fun to use, a breeze to paddle and offers plenty of maneuverability and durability, which is what really sets this board apart from competing models. There’s plenty of storage space for all of your gear and the board’s extra-large width makes it incredibly stable. While it may not glide quite as well as some higher priced models, it definitely offers the type of durability most riders need. Riders who purchased this board gave it a rating of four and a half out of five stars for cargo space, innovative construction, the triple fin setup and the overall quality. If you are looking for an alternative, check out the top rated stand up paddle boards from our detailed guide! This is a great board if you are looking for weekend fun inflatable standup paddle boarding on flat water. Be sure to check out our other inflatable standup paddle boards article and reviews. We here at SUP Boards Review thank you for checking us out and be sure to leave any thoughts or comments below. If you would like to see any specific stand up paddleboard reviews, please leave your thoughts in the comments below as well. Isle Inflatable Paddle Board Reviews - The Airtech Explorer	Overall rating:	5	out of 5 based on 5	reviews.